Rising up from the South Los Angeles Wetlands Park, Mast looks a little bit like something from a dream. The ship’s mast, a replica of the main mast of the first Spanish explorer ship San Salvador, is firmly planted in solid ground, but the way that the breeze fills the sails almost makes the viewer forget that they aren’t adventuring across the seas. Mast is motion and a whisper of adventure—the view of the wetlands park makes it seem as though the ship could sail right through the marsh, to the river, all the way out to sea. It also doubles as a shade structure in the sunny wetlands park, a blessing in the summer heat. HS Insider had the chance to catch up with Josh Callaghan and Daveed Kapoor, the minds behind Mast. Josh: Well, I think I’m very inspired by everyday things. I try to find things about them to show in a new way to make you think about new ideas by looking at something you’re already very familiar with. So, that’s the case with this. We’re trying to change the way that people look at utility poles. Also, it’s kind of interesting that this ship that we’re inspired by was actually built in El Salvador, you know? [Coincidentally] there’s a lot of Salvadoran people in the neighborhood, so that’s an interesting connection. Q: What inspired you to create Mast? Daveed: Josh! [laughs] We had that conversation about the Current LA prompt and the desire to create shade in this specific park. Josh had the idea of a ship, and we went down to San Diego and looked at the ship of the Maritime Museum of San Diego. The museum took us on board this reconstruction of the San Salvador. It’s truly like the first vessel, which made first contact with the native people of California. People beforehand lived in synergy with nature, and then when [the Spanish came] it kind of represented this new shift in the way we live with each other and on the land. Daveed: Improving the environment for people. Improving people’s connections with each other and their connections with nature. That’s what I love—when I bring people together and change paradigms of how we live and hopefully make it better. That park is such a beautiful new park, but it’s fenced off. There’s one entrance on Avalon for cars, but there’s no people gate. We wanted to blend the park with the neighborhood, and part of our demands for the city were to open the gates, which they did for the community event. But since then they’ve come back, locked everyday. But there’s a few little gaps in the fence where people can squeeze in. We wanted to connect people with the marsh, people with the park, and the park with the community. What would you say you’ve gotten from the experience? Josh: Well, I guess one of the great things is getting to spend some time in this park and getting to know this neighborhood a little bit. A big project like this requires a lot of people, you know, so you learn how to work with people. And now it’s really interesting to see, it’s kind of out of our hands a little bit. What happens now is in the community’s hands. 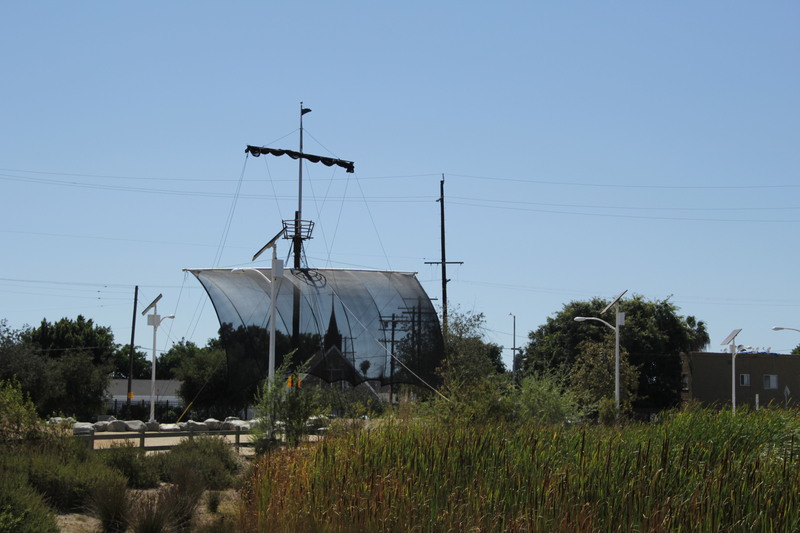 Mast will be on display in the South Los Angeles Wetlands Park through August 14.